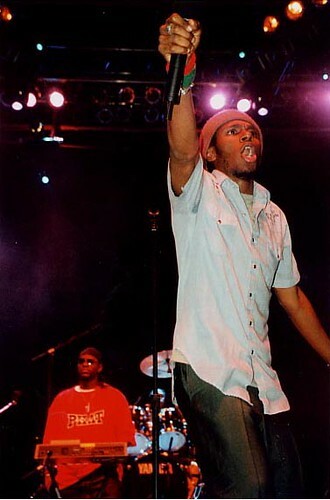 “The spirit of J Dilla was felt throughout Ann Arbor’s Hill Auditorium on Monday night, as rapper-actor Mos Def and his Big Band performed a tribute to the late Detroit producer, who died in February 2006 of complications from lupus. During a loose 90-minute set that felt more like a jam session than a proper concert, Mos Def and his six-piece band — which included a drummer, keyboardist, bass player, trombonist, trumpet player and a multi-instrumentalist — didn’t so much remake Dilla’s songs as bring to life the feel of his compositions. Mos Def took the stage with a bandana covering his face and a New York Yankees cap, and throughout the show he gave props to Detroit. (Close enough.) As he took the stage, Mos formed devil’s horns with his hand — the international symbol for “rock” — but instead of rocking put on a thoughtful, lively tribute to his friend James Yancey, one of the founding members of Detroit hip-hop troupe Slum Village. Mos was clearly having fun, grooving along with his band and often grinning from ear to ear. As he led his band through material from Dilla’s works — including pieces from Slum Village’s landmark “Fantastic, Vol. 2” — he was a rock star, deftly flipping between rapping, singing and occasionally band-leading. The sold-out crowd of more than 3,400 — some were dressed in “J Dilla Changed My Life” T-shirts — was on its feet for most of the show, even during the elongated bass and drum solos. If the show sometimes lost its way in its improvised jams — at times, the trombone player looked like he was going to doze off during the free-wheeling sessions — it was nevertheless rendered in a style that Dilla, whose mother, Maureen, watched from backstage, would have appreciated. Near the close of the show, Mos Def was presented with a visiting professor award, and he wasted no time in using his new title. “That’s Professor Def to you,” he told a crowd member shouting his name. During the closing number, Mos entered the crowd and shook and slapped hands with audience members, and stood tall in the center of the auditorium like a prize fighter celebrating a victory.